Amaco has a new challenge on their website. If you've been playing with Friendly Plastic then why don't you give it a go. They are inviting all crafters to participate in the challenge with cash prizes being awarded to the winner of each category. They will also make a donations to the winners' favourite charities. But even if you're not one of the winners, you'll still receive Friendly Plastic sticks to replenish your supply and as a bonus, your entry will be displayed in an on-line gallery on the Amaco website - so if you'd like to see your work published, then this might be just the challenge for you! 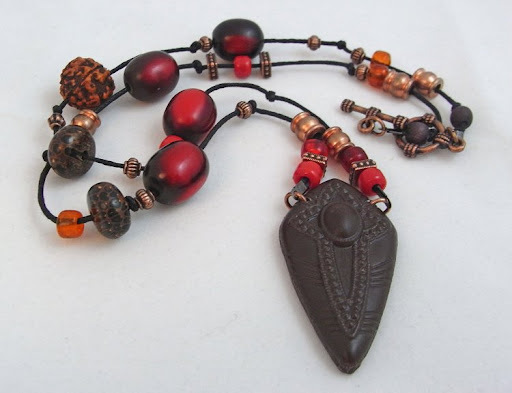 There are several categories including one to honour "Bottles of Hope" (read about the origins of Bottles of Hope here), the "Butterfly Project" plus two jewellery making categories. For more information, check out the details on their website. Sadly, (for my blog candy winner) she hasn't claimed her prize, but that's good news for the rest of you because now you have a second chance! The new winner is......... Comment #7 - Bec, who said "oooh. that's pretty. 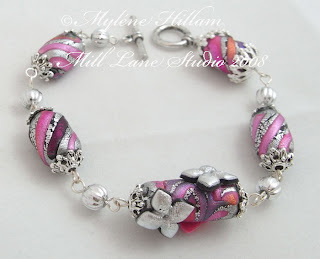 I've just started playing with resin and didn't even think to check KL for bracelet moulds! I think I'll have to get myself some. =)"
Congratulations Bec! You are now the owner of the handmade bangle. Contact me by email and I'll arrange for it to be on its way to you asap. And because I have always had an image of some sort in each post, I'm adding this one which has absolutely nothing to do with anything.... just because I think it's a fun piece! On Wednesday I was lucky enough to spend the day wandering the floor of the Brisbane Quilt and Craft show and I spent a good deal of time in the dedicated bead area. 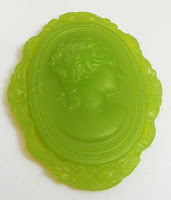 I was on a mission to find beads to use with some of my resin casts and this is what I came up with for a cameo I had cast in lime green. 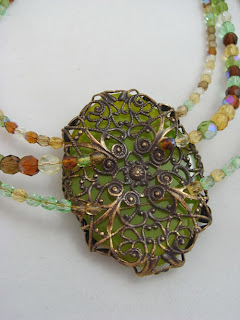 Place the cast on the brass stamping and carefully wrap the sides around it. Thread the crystals on tiger tail and thread through the back of the stamping. Secure ends with a clasp. And here's one I prepared earlier! Mmmm....... yummy! Look at the back view which is quite lovely too! Check back later to see what else I cook up with my craft show finds. 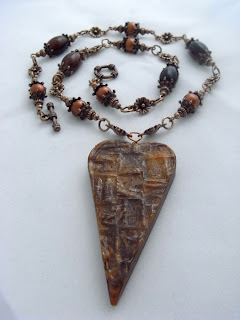 Thanks to all for leaving a comment on my blog - I hope you enjoyed wandering around to see what else I do. 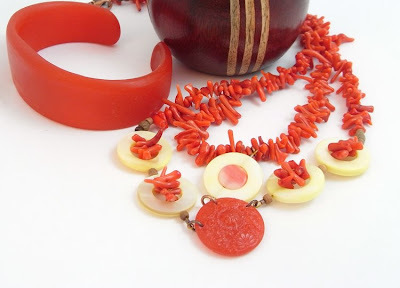 The winner is.......... Wendy in Oz, Comment # 1 - Hi Mylene, Love your jewellery! I'm a stamper / papercrafter who dabbles in beading as well. 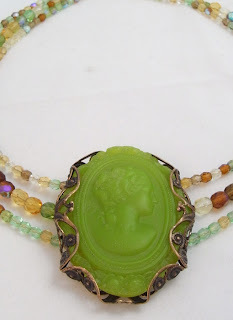 Your resin pieces are fabulous! Congratulations Wendy! Please send me your address and your prize will be on its way to you pronto. Sorry, you couldn't all be winners - I enjoyed reading the comments you left. But do keep checking back as I will have more blog candy to give away in the future. Like to win goodies? Then keep reading.... I have blog candy to give away! 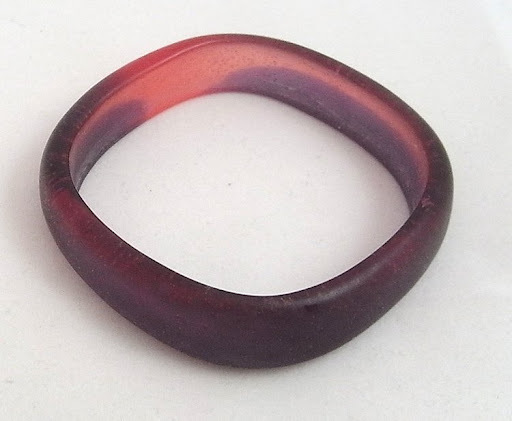 To coincide with my upcoming resin class I'm giving away this handmade resin bangle. 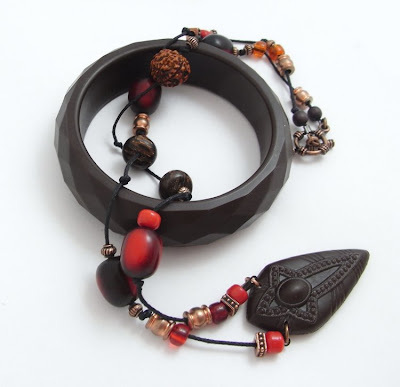 It's cast using one of the fabulous Krafty Lady bangle moulds that I use in this class and it's called Multi Faceted. For your chance to win it, all you have to do is leave your comment on this post and you'll be in the draw. You have until Sunday night (26/10) 8pm aest when I will randomly draw a winner. Don't live in Australia? Don't worry.... I will post internationally! 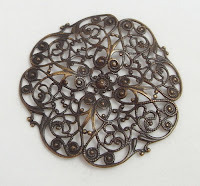 The winner must contact me by 8pm Tuesday night (aest) to claim your prize and I will have it on its way to you pronto. I'll redraw on Wednesday if the winner hasn't contacted me. 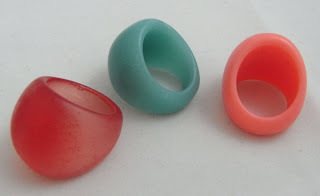 Now, whilst you're here, please have a wander around my blog - there's lots to see: tutorials, papercrafts, jewellery, resin, even organising tips. And there will be more to come, so please stop by again. Don't forget, leave your comment on this post and you're in with a chance to win..... Good luck! I spent this past weekend doing a lot of experimenting with quick curing resin. So I thought I'd share a few of the more noteworthy ones here. 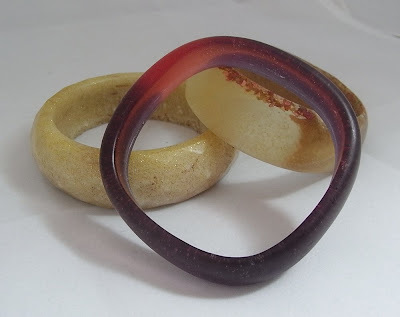 I had a few ideas floating around in my head about what I wanted to try such as using different materials in the bangles..... not quite what you'd call embedding as there's no placement of materials in the mould but instead, stirring an additive material directly into the resin before pouring to add colour and interest. And oh what fun I had..... one of the dry materials I had chosen caused the most incredible foaming reaction. Don't have a photo to show - really wish I did because it looked just like that expanding foam you use to seal around cavities - it just kept expanding and expanding - out and over the top of the mould and almost completely enveloping it before eventually stopping so I could think about rescuing it. What I learnt was that even materials which you'd think are bone dry can still contain moisture! 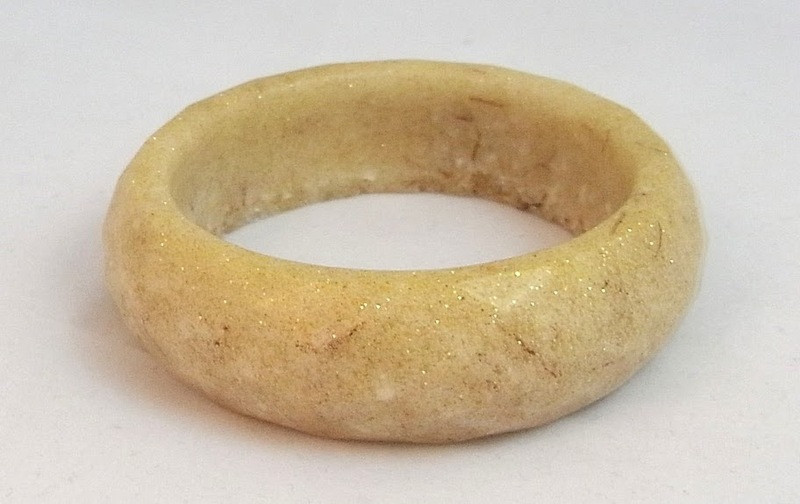 Well anyway, it's produced a very interesting bangle. And with so much air trapped inside it, its lightweight too! 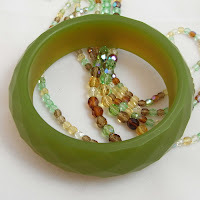 I'm calling this my Floam bangle - a disaster turned into triumph. It's actually quite glitzy but the photo hasn't picked up the glitter in it. 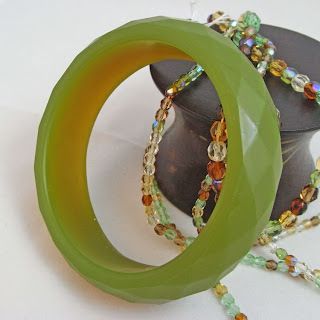 Here's another couple of experiments I tried - this first one using metallic coloured glass shards which were predictably too heavy to stay suspended in the resin and they are all sitting around the rim. This was a simultaneous pour job - tricky to do but it produced an interesting result. This one is also a double pour, but one after the other instead of simultaneously. You have to work ultra fast doing this with quick curing resin but I think it's worth experimenting some more with this technique. I love these colours - another piece to add to my wardrobe, I think (see this earlier post). I also played with a ring mould - nothing fancy here, just colour and pour. Just a bit of fun! I still had problems with bubbling - more noticeable on the translucent red than the opaque ones - must have been a fair bit of moisture in the air yesterday. 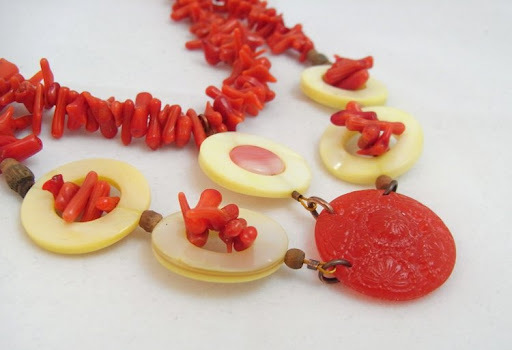 Another thing to remember - make sure you're not working in humid conditions with PU resin! Thought I'd also add a reminder here that there are still a couple of places left in my next resin workshop on 8th November. Email me to register your interest or check out my website for further details. 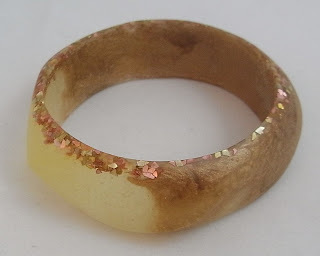 Oh, and I've updated my resin bangles page with some newer photos - why don't you check them out. Whilst I was out on my search for dividers to fit my Effektiv drawer units earlier this week I came across a nifty product at Spotlight called Snap & Fit. This is a clever idea - you bend the plastic strip at the length you want and it snaps - no knife required! 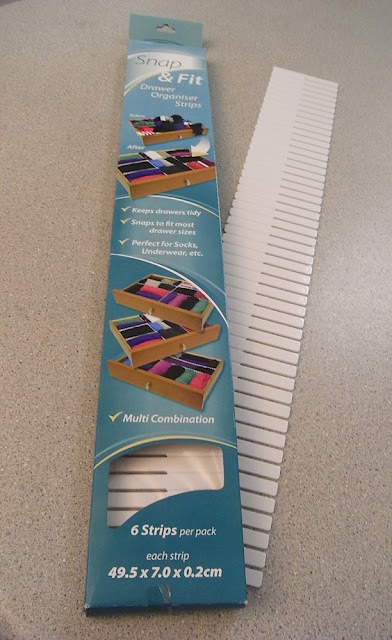 Then create your dividers by slotting the horizontal pieces into the vertical ones. My "before" picture looks much like the one I posted about a couple of days ago so no need to show you more of the disorganisation but the "after" pic certainly looks good! 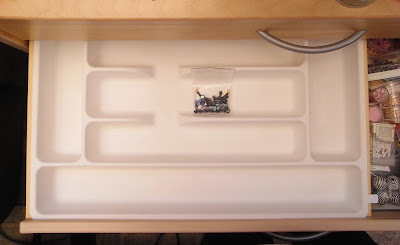 The plastic lengths are a bit flimsy until you begin to construct the dividers and I found that it's good to create small to medium sized compartments to give the whole thing more strength - it is after all only 2mm thick so it has a tendency to bow if you overfill the compartments. Each pack has six 49.5cm lengths and after putting together the dividers for this drawer I still had a couple of lengths left over to make a start on another drawer so for just under $10 I reckon that's pretty good value. Wow, who knew organising could be such fun! Lately, I've been feeling so cluttered and disorganised! Look at the inside of one of my bead drawers - no order, hard to find what I'm looking for, and a bit of a tangle. 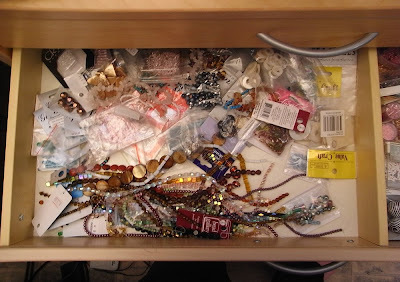 Unfortunately, most of my bead drawers look like this so it's time to bring some order to the chaos of the contents. 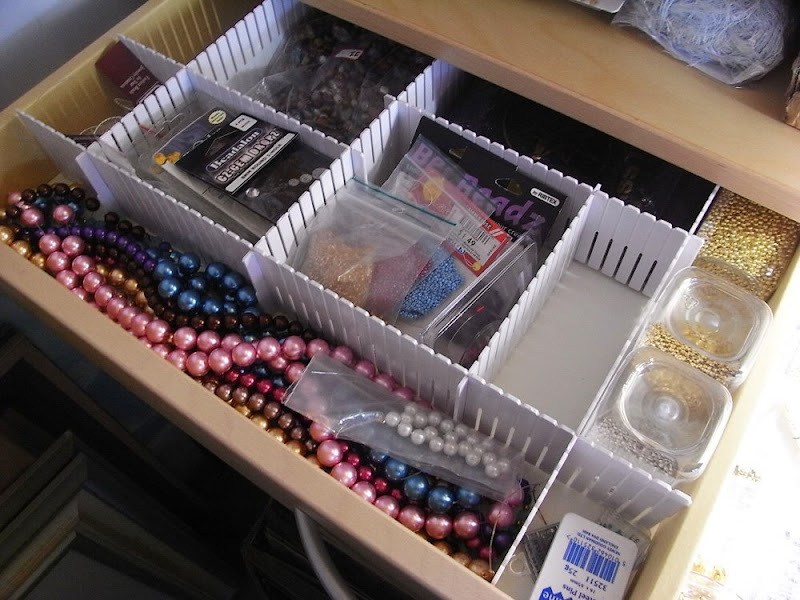 I have some fabulous Effektiv drawer units which I've posted about before (alas, they are no longer available). Some house my stamps and papers and others house my beads and findings - and that's where I'm at, at the moment. I finally came to the conclusion that I need dividers to help organise this drawer and so off I went to Ikea to see what I could find. There were a couple of options such as the dividers designed to fit into the Effektiv drawers but I took a chance on the Rationell cutlery tray and it fits perfectly inside the drawers.... There is even a slot at the front of the drawer that the lip of the tray slides into and there is enough overhang on the sides to support the rest of the tray! Neat, but the drawback is that you don't make the most of the depth of the drawer.... there is about a 3cm gap underneath the tray just going to waste so I decided to trim away the side edges with a stanley knife and now it sits flat on the bottom of the draw. A good solution at just under $4! And here it is neatly organised.......chaos into order! I'm pretty pleased with the result and I have to say that this has been one of the easiest organising tasks I've undertaken so far. 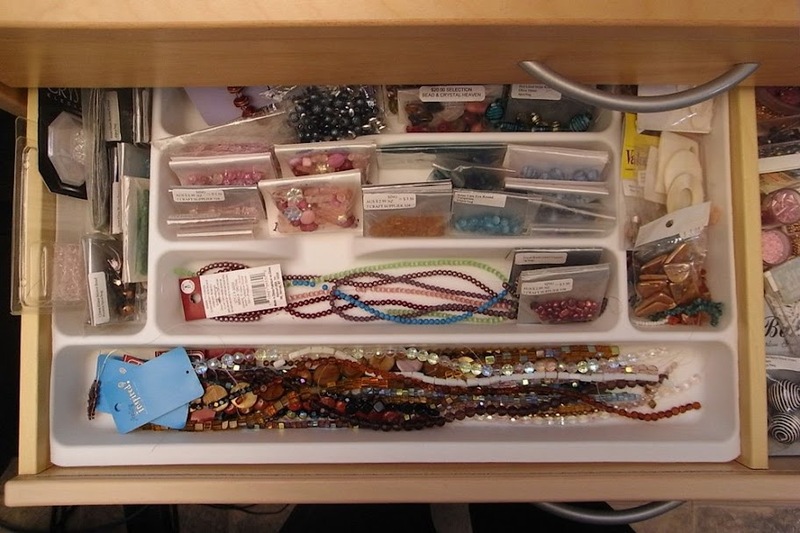 I still have a lot of tidying and organising to do in my studio, but with a bead drawer that I can now find my beads in, I think I'll reward myself with some time to make something!